It is such a common household activity, and yet it can be very dangerous for kids. The July issue of the American Academy of Pediatric News gives some very important tips and recommendations to prevent injury. In 2010, 17,000 youths under age 19 were treated for lawn mower-related injuries, according to the U.S. Consumer Product Safety Commission. 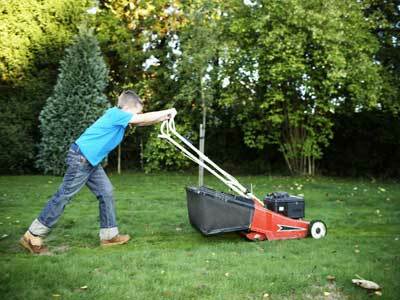 Boys with an average age of 11 make up 75% of children injured by lawn mowers. The most common injuries are bruises, broken bones and sprains affecting the hands/fingers, legs, feet/toes as well as eye injuries. The American Academy of Pediatrics recommends that children should be at least 12 years old before they operate a walk-behind mower or hand mower, and 16 years old before driving fa riding mower. Regardless of age, children should show maturity, strength and coordination before being allowed to mow the lawn. • Use a mower that has a control to stop the blade if the handle is let go. • Don’t pull the lawn mower backwards unless absolutely necessary. • Turn off the mower and wait for the blades to stop before removing the grass catcher, inspecting or repairing the mower, or crossing gravel paths or roads. • Keep other kids out of the yard when a lawn mower is operating. • Don’t let kids ride as passengers on riding mowers. • Wear closed toed shoes, clothing with long sleeves and long pants when mowing the lawn. • Wear protective goggles. If a lawn mower runs over an object in the yard, it could be tossed up in the air and hit someone in the eye. • Wear earmuffs or earplugs to protect ears from the noise of the motor, which can cause hearing loss. • Don’t listen to music while mowing the lawn. The sound of music plus noise from the lawn mower can be dangerous for your ears.